The Loose Button team recently announced that they are going in a new direction and instead of sending out monthly boxes, they will be sending them out quarterly. June was going to be the last monthly box that they would send out and from there on, you would be able to continue or cancel your subscription. However, if you still had monthly boxes that were supposed to be sent out, Loose Button gave you credits that you could use towards the “new” quarterly boxes. Their decision to switch came out of nowhere! I still have credit, so I guess I will have to use it up. I received it yesterday. What day was yesterday? July 4th. And this is a “June” box. Sigh. – I am amazed that they included this full size product which is worth $60 CAN. I received a small sample of this eye cream in a previous box and I am enjoying it. – I have only tried Philosophy’s 3-in-1 products and have heard mixed reviews of other products. I am quite content with using the Cetaphil cleanser, so I will see how well this Philosophy cleanser works as it also claims to remove makeup. – These I have been meaning to try! I bought one that is still sitting in my drawer because I am waiting for a special occasion to use them. I have heard great things about these because they are easy to apply apparently, non messy and can last up to 10 days. – Great travel size samples. – I already have a purse hanger that is not being used… I will probably give this away! It’s nice that they included this as a bonus product for this box. All in all, this was a decent box compared to the last few that I received. Looking forward to purchase the first quarterly box in August just to see what it’s about. What did you receive in your June luxe box? Fall 2012 LuxeBox « take her word. 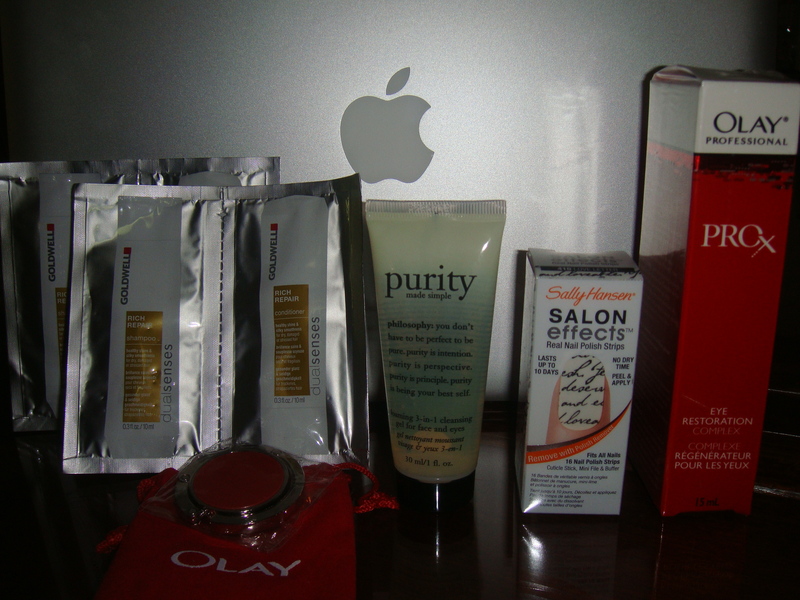 It’s not a bad box and I’m kind of glad I skipped onto the August box, just because I’m not a huge fan of olay. The purse hook is really useful!